OXFORD, Miss. – Oxford is again the destination for scientists and other visitors from around the world gathering to discuss the ancient, yet rapidly evolving, study of botanical medicines. The 17th annual International Conference on the Science of Botanicals is set for April 3-6 at the Oxford Conference Center. The National Center for Natural Products Research at the University of Mississippi School of Pharmacy organizes and hosts the conference. As the nation’s premier hub for natural products research, the NCNPR is internationally known for its botanical products expertise. More than 250 people from universities, government and business institutions attend the conference to learn about advances in technology and research that can benefit their organizations. Presenters include representatives from the U.S. Food and Drug Administration, the U.S. Pharmacopeia and Procter & Gamble. Cara Welch, senior adviser at the Center for Food Safety and Applied Nutrition in the Office of Dietary Supplement Programs of the U.S. Department of Agriculture, will deliver the keynote address. 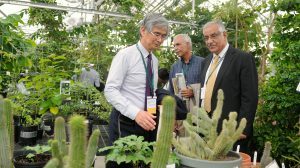 Besides promoting the sharing of knowledge among the world’s medicinal plants experts, the conference is designed to promote rapport and collaboration. Many of the repeat attendees have become friends, and ICSB is also their chance to get together. As part of this camaraderie, attendees eat dinner as a group each evening, sample international food and have a picnic one afternoon, complete with competitive field games and entertainment. Khan was instrumental in establishing the ICSB and will be honored on the first night of the conference with an award from the American Botanical Council for his work in fostering scientific community. For more information on research and education programs in the School of Pharmacy, go to http://pharmacy.olemiss.edu/.